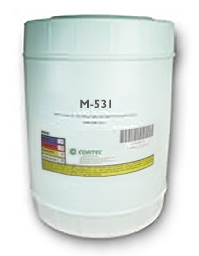 M-531 is an oil-based package of corrosion inhibitors for petroleum and synthetic lubricants. M-531 provides outstanding non-staining properties with excellent demulsibility and filterability. M-531 is very effective for napthenic, iso-paraffinic, PAO, etc. based lubricants. M-531 can be used in a wide variety of industrial lubricant applications where excellent rust protection, filterability, and water resistance are required. In rust preventive applications it is particularly useful for coiled steel or stacked parts due to its outstanding non-staining properties. M-531 is highly recommended for use in hydraulic fluids. M-531 is also ideally suited for formulating paper machine oils and circulating oils where good filterability, anticorrosion, thermal stability, and demulsification properties are required. Available in 5 gallon plastic pails (Cortec Product # 12100022) or 55 gallon metal drums (Cortec Product # 12100023). 5 gallon drum weighs 50 pounds and ships under our standard shipping rates. The 55 gallon drum must be shipped by truck. We will provide you with a freight quote before we ship this product. Store in a cool, less than 115°F (46°C), dry place away from any direct source of heat and moisture. M-531 should be sealed before storage. The shelf life is up to 24 months.